We create taylor-made systems for your individual needs. Scan barcodes or RFID tags right into your FileMaker fields. Scan and manage your documents in your FileMaker solution. 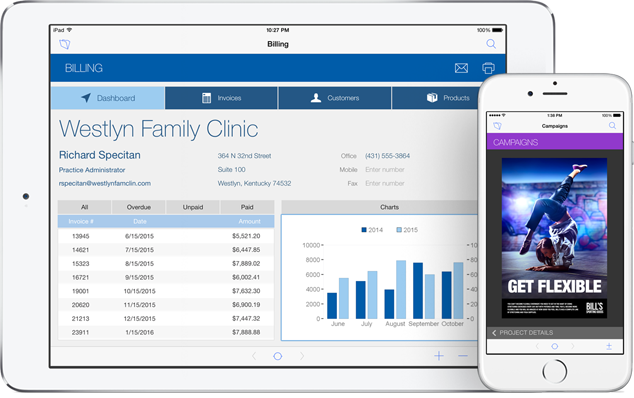 We create mobile FileMaker solutions (iPad, iPhone, Android). Cloud hosting is the most cost-effective way. We are the people who can help you run your business better. We will analyze your business process to find black holes and make recommendations before we build a solution. There are a lot of FileMaker Developers out there. What differentiates us is that we know what users want. We build the kind of apps that matter to users. We work in phases giving you what you need when you need it. We’ll talk you out of unnecessary and bloated features. We’ll design a mockup before building your solution so you can see what you will be getting. I received very detailed summaries of the hours that were worked on; which is not always the case with other developers I have worked with. Always available and clearly willing to go the extra mile to make us happy. ZeroBlue translated our needs and ideas into a very attractive, functional, and professional website that is well received by our collaborators and the investment community. We have nothing but the highest respect for ZeroBlue and would highly recommend their services. The project is a score board for the annual Pi5NY tournament. It’s mission critical and deals with a very fast-paced environment with literally hundreds of screaming kids running around. The system had to be fast, accurate and easy-to-use.